Test our new feature and release your music straight to Spotify’s millions of listeners. Uploading music through Spotify for Artists is currently available by invitation to independent artists based in the United States. To be eligible to release through Spotify for Artists, you must control the distribution rights to your music, and you must have a US bank account and tax ID. Right now, we’re testing these features with artists and using their feedback to improve these tools before we expand availability. We’ll be rolling out to more artists and labels over time, and you can sign up here to learn more about our plans. We don't charge fees or commission. There’s no cost to upload music through Spotify for Artists, and you’ll receive all of your royalties without paying us any fees or commissions, as detailed in the content license agreement you’ll be accepting as part of the program. 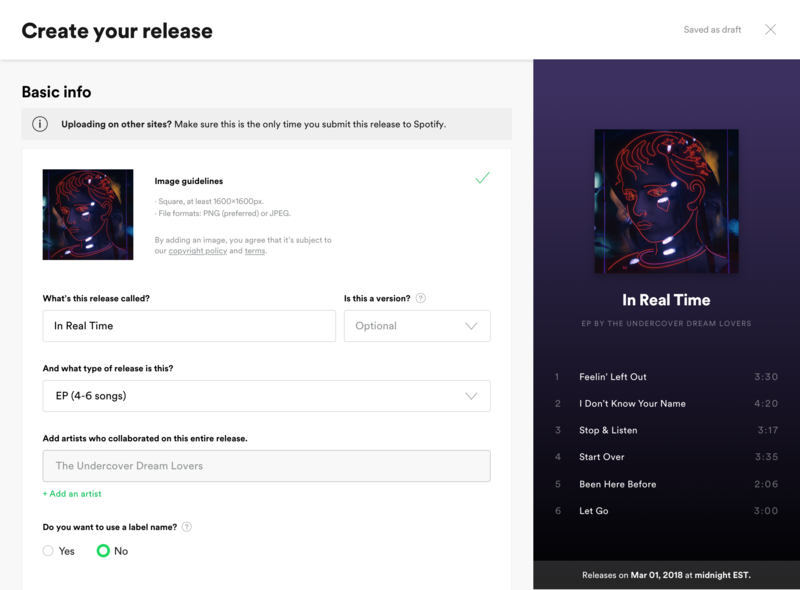 Click the green upload button in Spotify for Artists to create a release including music files, album art, and the correct metadata. You can release singles, EPs, or albums, and you’ll see a preview of how your music will appear to listeners before you submit. Music files. We accept WAV, WAVE, or FLAC (16- or 24-bit with sample rates 44.1kHz or higher). WAV and WAVE file formats must be PCM. Album art must be square, at least 1600 x 1600px in PNG (preferred) or JPEG format. By adding an image, you agree that you have the right to use it and that it’s subject to our copyright policy and terms. The names of your collaborators, including featured artists and non-recording collaborators like songwriters and producers. If you plan to also release through another distributor, you should be careful not to deliver the same content to Spotify twice to prevent errors in metadata, stats, and royalties. Take control of your release. When your music goes live. You’re able to choose the date your release goes live to listers. But because it takes time to get your music ready for opportunities like Release Radar and editorial playlist consideration, you must submit at least seven days before your desired release date. All releases through Spotify for Artists are global, so your music will appear to listeners starting at midnight local time in every territory where Spotify is available. Before you submit your release, you can save a draft and make edits until you feel ready. Once a release has been submitted, you can make edits to the metadata until one week before the scheduled release day. After your release has gone live, edits and takedown requests will take effect in about two days. ISRC codes are required for every track within a release. We’ll provide them free of charge as you prepare your release, or you’re welcome to use codes that you’ve already created elsewhere. Guidelines for uploading music to Spotify. Content that infringes on copyright is not allowed on Spotify, and we may prevent you from uploading potentially infringing content through Spotify for Artists. If your upload is blocked, you’ll need to contact support before you can submit your release. If your content is found to be infringing on copyright after it goes live, it will be removed. Get paid for the music you upload. Only music that’s been released through Spotify for Artists will receive recording royalty payments directly from Spotify. If you’ve delivered music to Spotify through a label or another distribution partner, contact them with questions about your royalties. Publishing royalties for songs underlying the sound recordings released through Spotify for Artists will still be paid to appropriate rightsholders through existing relationships with local and international performing rights societies (e.g. ASCAP, BMI), mechanical rights societies (e.g. Harry Fox), and/or music publishers. Such royalties are generally not paid to songwriters by Spotify directly. If you are the songwriter for any tracks, be sure to register your works with the appropriate societies. View your royalties each month. The first time you submit a release through Spotify for Artists, we’ll ask you to provide your bank information so we can pay you royalties. You’ll do this by setting up an account with our payment service provider, Stripe. You’ll need your bank routing number and account number, and personal information including your legal name, address, phone number, and Social Security number or Employer Identification Number (EIN) if you’re registered as a business. Royalties are calculated at the end of each month based on the number of times listeners streamed your music, in accordance with the Content License Agreement. 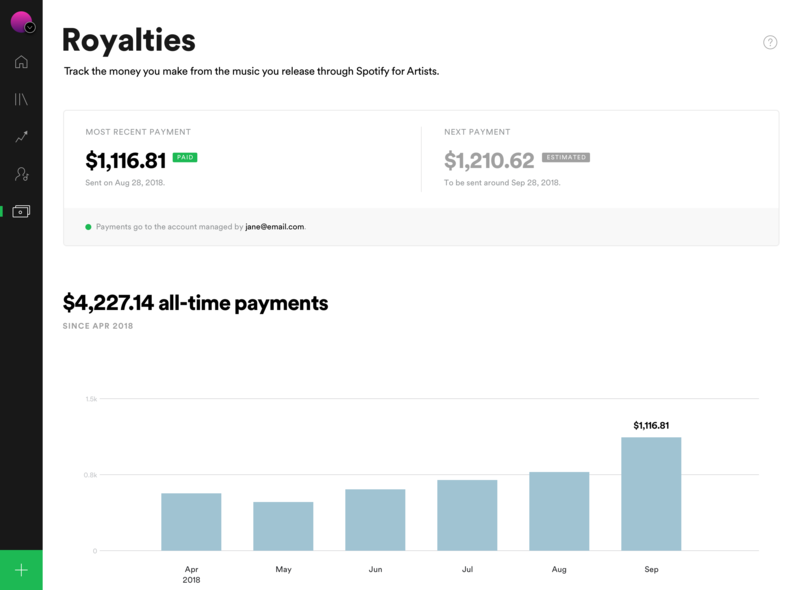 We’ll post your earnings and upcoming payments to Spotify for Artists in the first half of the following month, and you’ll receive payment in the second half of that month. Keep an eye on your royalties. View information about your previous and upcoming royalty payments in the Royalties section of Spotify for Artists. In this section, you can see the status of your bank account, access the link to your Stripe dashboard to make changes to your bank account, view your next estimated payment, and review your total historical payments. If you’ve had no streaming activity for a particular month, you won’t see any stats. Receive royalty payments to your registered business. If you or your band is registered as a business with an Employer Identification Number (EIN), you can sign up to receive payment from Spotify as a business, which will also impact how we report payments to you and the government for tax purposes. Consult a lawyer or accountant if you’re not sure which choice is right for you. Change how you get paid. You can check your payment information by visiting your Stripe dashboard from the Royalties section. You can change your address and bank account information through this dashboard at any time, but to change any other personal information—including your legal name, date of birth, or tax ID—contact Spotify customer support. Only the person who first created the Stripe account will be able to update the information in the future. If that person has since left your team, contact customer support. We’ll help you file on time. At the end of the year, you’ll get an email from Payable (Stripe’s tax reporting tool). If you’ve earned $10 or more during the year, Payable will send you a 1099-MISC form that you’ll use to file your taxes. For more info, read our tax prep FAQ.